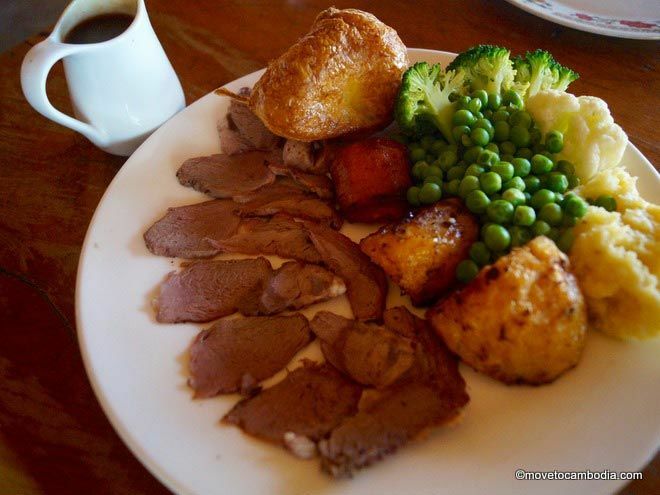 The Sunday roast, an English staple, has found a home away from home here with the many expats in Kampot. Not one, not two, but three different restaurants fire up their ovens to bring that warm, comforting goodness every weekend. If you’re tempted by the thought of a Sunday roast in Kampot, Bokor Mountain Lodge, Brass Monkey, and Rusty Keyhole Two each offer a slightly different menu with tasty sides and mouth-watering mains. Rusty 2 offers the most choice for Sunday roast, including roasted lamb with mint sauce, roasted local pork with applesauce and crackling, and roast beef with horseradish sauce. If you’re wondering how they can get nice cuts off the skinny cows here or question lamb after noticing the distinct lack of sheep, rest easy. 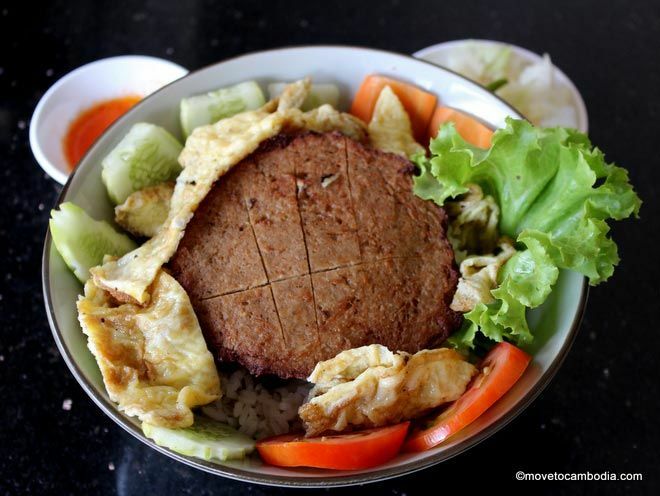 Both the lamb and beef are imported from Australia to guarantee tasty cuts of meat. Each meal comes with roasted carrots, peas, broccoli, mashed and roast potatoes, two Yorkshire puddings and a thick, beefy gravy. This is the only place with Brussels sprouts, which you can add for $1. Be sure to get to Rusty 2 early if their menu tickles your fancy because they tend to sell out in just a few hours. In my humble opinion, Bokor Mountain Lodge makes the best Sunday roast. I know several people who would argue with me because they do not have roasted pork, but I stand firmly by my taste buds in this case. You can choose between half a roasted chicken or Australian topside beef with horseradish sauce. The whole delicious affair comes on a plate-sized Yorkshire pudding there to soak up the juices from the tender meat. The half chicken is more than enough for two people and literally falls off the bone. They fill the Yorkshire pudding plate with roasted and mashed potatoes, peas, broccoli, carrots, and serve a homemade gravy on the side. The gravy changes weekly and often includes red wine. Find a friend to split the giant Sunday roast or take some home and heat the rest up later. 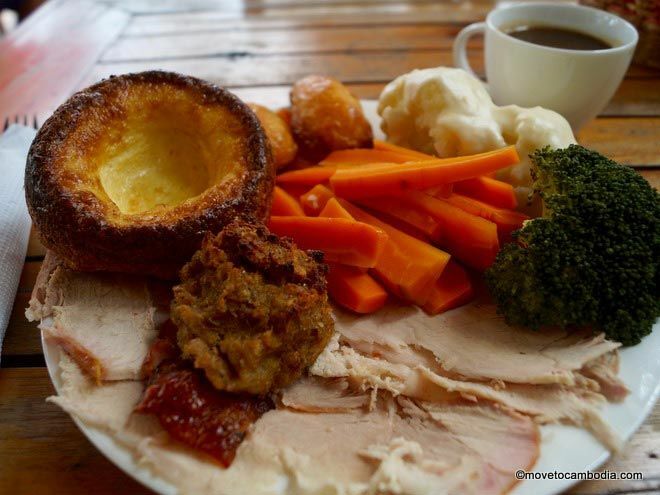 Brass Monkey’s Sunday roast can also be enjoyed on the riverfront, but on the opposite side of Old Market. They keep it simple and stick to roasting local pork only. Sides include the standard fixings of broccoli, carrots, roasted potatoes, and a Yorkshire pudding with the addition of cheese-smothered cauliflower and homemade stuffing. Brass Monkey is more bar than restaurant so every large roast ordered comes with a free draft beer. 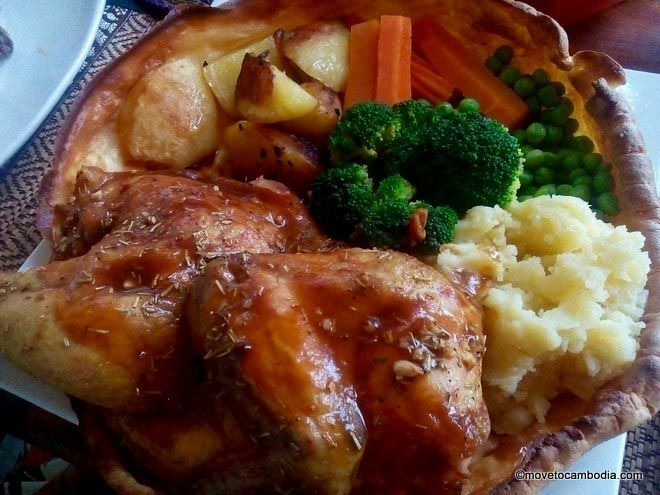 If you’re hungry, do not hesitate to order the large roast to calm your Sunday roast craving. All of the Sunday roasts in town are served starting from 12 noon until they sell out. Open daily, 8 a.m. to 1 a.m. This entry was posted in Kampot, Food and tagged Bokor Mountain Lodge, Rusty Keyhole, Brass Monkey, Sunday roasts. Bookmark the permalink. I lived in Kampot for 11+ years from 1996-2007 and that is so cool that there are places offering a Sunday Roast. Rusty Keyhole has come a long way from the beginning. 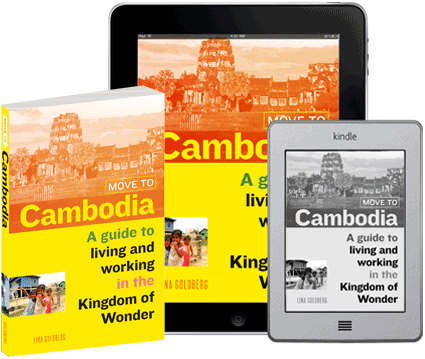 I plan on moving back to Cambodia next late spring, early summer and look forward to the way of life I have missed. Plus I have extended family now in Cambodia due to my children marrying Cambodians.